This wasn't the first time Lirr has set foot in the land of Vromme and surely not the last. Not as far as he was concerned anyway. The marshy land of delicate flora spread out below him as he continued to soar. While it didn't share the same breath taking aerial view as Ambrosious, he knew it's image was unmatched from the ground. Water reflecting the pristine blue sky along a sea of green and pastels. Simply stunning. Below him, the ever familiar flood planes graced his view. It was here that he met the a rather dashing, if not grumpy stallion with a crown of tree like antlers and tail of dragons. Sure he was handsome, but he was no Björn. The thought of the large stallion hung in his brain like a treat just out of his grasp. It left a warm, comforting feeling in his heart, the image of the man's hellfire eyes gazing with such an ironically gentle tone. A smile had unconsciously melted onto his face, just letting himself glide for a few moments as he drifted off into dream land about the brute. He suddenly startled back to reality with a flutter of all four of his wings. He'd dropped much lower in the sky by this time and quickly rose back up a few meters. His heart beat furiously from the fright, looking around the wetlands only to notice that it appeared strangely... empty. He had been invited to return by a woman painted in the color of the sunset, but by the looks of it, there was no one here. Not wanting to muddy his hooves, he continued gliding until the lake like shallow body ceased and the land rolled up into the most gentle of hills. He was graceful in his landing, inky hooves dancing through the grass as his momentum forced him forward. It was a pleasant pace though, a gentle trot as he tucked his wings into his sides, letting the long end feathers bounce with each step. Leaving the water logged area behind, it wouldn't be long before he started to see others scattered about. Lirr may be on the smaller end of the scale, but he was hard to miss and by the looks on their face, new comers weren't that common. Looking up ahead, he saw what may be guards of some kind who were utterly baffled by his presence. "Excuse me Loves!" He called out, trotting up to the pair as they watched him like a dear in headlights. Not that anyone here knew what the latter was. The two large equine gave each other a confused glance before looking down at him again in silence. "... Well aren't you two a pleasant bunch. I'm looking for a Miss Kagura? She invited me, though I suppose anyone in charge would be helpful." It was as if he were talking to rocks. Neither one of them uttered a word at first, both baffled by him mentioning that name and at his sheer audacity. After a few more moments of silence, the smaller of the goliath's finally managed to mutter "What?" "Such an insightful pair, perhaps you could lead me? Afraid I don't know the area." Recovered from their initial shock, but still quite uncertain on what to do, the two stallions glanced again at one another, as though each were waiting for the other male to supply something helpful. When nothing was forthcoming, one finally coughed uncomfortably and made a valiant effort to answer Lirr's question. "The lady Priestess isn't here right now," he muttered gruffly, ostensibly rubbing the bridge of his nose brusquely against one foreleg to avoid eye contact with the flashy and very friendly Lirr. "Hasn't been seen in a while, actually. Heard she had a baby a while back and has been keeping to herself." His companion nodded in agreement, but stubbornly kept his mouth shut and supplied nothing of his own. Perhaps it was for the wiser, as he seemed very much distracted by the splended golden lace marks over Lirr's ebony hide, eyes drawn helplessly to their intricacies as though of their own accord. The more talkative of the two caught a glimpse of this from the corner of his eye, then gave his companion a quick shove to the shoulder. "Anyway, Lady Kagura ain't Jarl here anymore. You want the Sovereign instead?" he offered. "I'll take over from here, thank you," cut in a smooth and not entirely unfamiliar voice to any of the three. 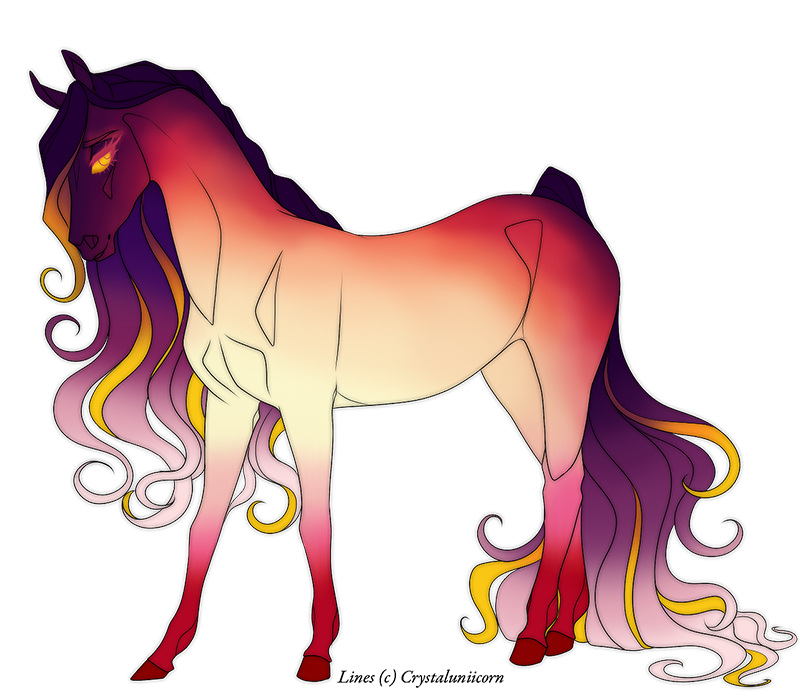 Both Vromme stallions jumped in surprise, the silent one a little guiltily, and they quickly stepped back to allow space for the arrival of a brightly-colored lady and her foal, none other, of course, than the priestess herself and her daughter. Higurashi looked very little changed from how the Vromme herdsmen remembered her, perhaps a little thinner and more tired-looking, but that smile was still as disarming as ever, her sunset coat just as vibrant. "Ohayou gozaimasu, Lirr-han," she greeted the newcomer, her tone still politely formal but sparkling with added familiarity. "Welcome back to Vromme; I am so pleased to see you again. May I introduce my daughter, Kasumi?" A small nod of her violet-crowned head indicated the filly at her side, who had heretofore remained a quiet and retiring figure in the background. As Higurashi allowed her daughter to step forward and greet Lirr in her turn, the former Jarl turned to the two Vromme stallions who still stood to the side in surprised silence. They said nothing to her, but both were not-so-subtly feeling rather guilty about having been overheard gossiping about her recent demotion. Even if the golden-eyed priestess didn't have that uncanny ability to see straight into the heart, the awkward looks on their faces spelled it out as clear as day. "Come now," she said with a silvery laugh, "no need to be so stiff. Thank you for greeting my friend here, and I am honored that you missed me in my absence." Another glance was shared between the duo, even less certain now than before if Higurashi was actually rebuking them or not. Falling back on old habits despite the equality of their current ranks, they settled on nodding stiffly to her and excusing themselves as quickly as courtesy allowed. "Welcome back, Lady Kagura. We'll be on our way now." The little filly by Kagura's side - not so little now, compared to her first introduction to the herd - gingerly stepped forward upon prompting from her mother. Still lanky, slim as a willow, and more legs than body, the girl had nonetheless clearly grown quite a bit over the last months she hadn't been seen. She now bore herself with the grace lacking from a young foal still unaccustomed to its legs and, despite her tender age, carried her vibrant and heavy crown of golden horns with all the solemnity of a little princess. No longer did she shrink away from strangers like a wilting lily and instead approached the gold-and-black pegasus with quiet confidence and a pale smile, although the swishing of her violet leonine tail behind her betrayed some of the underlying nervousness. When she bowed to Lirr the way her mother had taught her, back straight and posture perfect, she greeted him just as politely in her quiet but clear and sweet child's voice. "Hajimemashite, onii-san," she said, calling him 'elder brother' in lieu of a name. Kasumi had no idea how her mother knew this dark winged stallion, but as far as she was aware her mother knew just about everyone, so it came as hardly a surprise. He seemed friendly enough, or at least Higurashi had called him a friend, so Kasumi was ready to accept him as one herself. Her own clear golden eyes, so much like her mother's but lacking the sharpness and knowing of Kagura's gaze, were naturally drawn to the gleaming designs on Lirr's wings and coat. She had been taught better than to stare, of course, but the stranger's beauty was irresistibly fascinating. The small stallion didn't really seem fazed by the silent guard's staring, but instead seemed a bit frustrated with the talkative one whose information was more or less useless to him. He raised a single brow as he continued to ramble on, mentioning the sunset priestess' essential 'fall from grace' as she no longer bore the title of Jarl. She didn't seem to the type to make enemies so perhaps it was of her own choice. Nevertheless, it seemed strange that he would just willingly give up this information to someone he didn't know. When he was finally offered to see the sovereign, Lirr started to open his mouth to agree, knowing he couldn't just wander about without saying hello, but before he could get the words out, a sweet, chorus like voice chimed in. His ear quickly turned to the side and his head followed. his lips curled up into an excited smile at the sight of her. It took a moment before he noticed the smaller female at her side and he couldn't hide his excitement. While he had no idea who the father was, there was no mistaking who the mother was. "Miss Kagura!" He chirped, turning to face her, his eyes going back and forth between them. "It's been longer than I thought if you've got this little sweet heart." He cooed to the pair of them. He was fascinated by the little filly at her side. Unlike what he expected of a child, she was very calm and reserved. Sher certainly took after her mother in terms of a quiet charm and allure. Her young voice was just as pleasant and seemed to draw the listener in to it's soft tones. "It's a pleasure to meet you Miss Kasumi." He bowed his head back to her though she seemed more practiced in the art of it than he in her short life. As he moved his eyes back up to meet Kagura's, he continued on though was sure to come back to the filly soon enough. "I guess we have a lot more catching up to do than I thought. Wanna go chat somewhere more..." He looked over her shoulder a bit to the guards who hadn't quite left the area yet. "more private." He before looking back at them with a warm smile. "Certainly," the priestess acquiesced readily to his suggestion, and without hesitation she stepped around to Lirr's side like a lady taking a gentleman's proffered arm for a stroll. A smile and a nod were given to Kasumi, though perhaps needlessly as the little filly knew even without such cues to follow close behind, and like that Higurashi led her guest off at a leisurely pace, away from the retreating forms of the stallions who had greeted Lirr's arrival. One cast a dubious look over his shoulder at the priestess's colorful figure, as though in her enigmatic smile were still held the clues to his unanswered questions, but the lady looked back not even once. The autumn was slow to take these southern holds, and hints of summer could still be heard whispering among the tall grasses and laughing with the babbling brooks. Where the landscape had been parched brittle and brown in other territories, here the wide rivers kept the surrounding flora tall, strong, and green upon their banks, in proud defiance of the inevitability of the cold and dead months. It was to the shores of one of these winding waters that Higurashi brought her pegasus companion, wading through a bank of nodding reeds, letting the tallest grasses tickle her legs and underbelly, happy to let young Kasumi monopolize Lirr's attention until they at last gazed out upon the smooth expanse of the river and the grasses on its other shore. Slow-flowing, as though in no hurry to arrive at its seaside destination, the glassy grey surface gleamed with only the smallest of wind-ripples to mar its otherwise perfect image of the puffy clouds above and to mark its passage through the Vromme holds. This vista she admired for a long beat, golden eyes sweeping the river as though looking for visions in its surface, before she gently re-inserted herself into the conversation at hand. "Well, Lirr-han," she said genially, with a twinkle of what could have been impish amusement in her eye, "I am certainly pleased to see you doing so well. Tell me, do you still dance freely about these lands wherever you please, untethered to hold or kingdom? If so, you must tell me all about the wonderful places you've been, the people you've met... and of course the special one who has done the impossible and captured such a free-spirited heart." Love is sweet, after all, and though the phrase might be meant metaphorically to most, to a keenly intuitive empath like Higurashi, the happy glow of new love that Lirr was practically bathed in was sweet in a much more literal sense. Kasumi said nothing more beyond her initial greeting, but her quietness still did not mask the undeniable curiosity about the way that she observed Lirr's every word and move. There was no shyness, either, that one might have expected from a child newly learning about stranger danger, not the slightest apparent inclination to run and hide behind her dam like many children her age might. The girl's solemn, unabashed gaze seemed just a little too mature for her diminutive frame, a little too world-wise... But then she would turn and bound after her mother with that uniquely gangly, leggy gait of a young child, and suddenly she was her own age again, full of wonder and innocence. "Onii-san," she called out sweetly to Lirr as she caught up at a brisk trot, coming up on his left so that she and her mother flanked him on either side. "Onii-san, why do you have wings?" The question was so direct, guileless, and without preamble that it could only come from a foal like her, and the seriousness with which she asked made it clear that she had put some serious thought into the matter. Slowing down to a walk to match their leisurely pace, Kasumi looked up and directly into his eyes fearlessly, as though she might find the answer swirling there in those depths. In the light of a question that needed answering, her inquisitiveness overtook her quiet nature, and the filly explained herself as best she could, with flawless child's logic. "Not everyone has them, but all birds have them and they fly like you. Are you a bird, Onii-san?" And so it went until they arrived at their riverbank destination, but Kasumi had more eyes for the beautiful Onii-san and his massive wings than for the waters that were as familiar to her as her own hooves.